Written on September 21, 2005 by Kevin. It has been a while since I last updated the weblog with information about my wife and baby. Last week my wife was told that her belly size shows that she is 2 weeks larger than she should be. Today we were able to confirm this with a third ultrasound. After a bit of measuring, the technician was able to confirm that the baby is 1 to 2 weeks larger than normal. My wife is 35 weeks 5 days and the ultrasound says 37 weeks. The technician guessed that the baby could currently weigh about 6.5lbs to 7lbs (71% percentile). My wife has been complaining that the baby is too big lately and now we understand why. The rest of the ultrasound went great and we got to see some more great pictures of the face, heartbeat and even his lungs practicing to breathe. Everything appears to be as planned and other than the additional size of the baby, it appears to be good. My wife will have a doctors appointment next week in which we will get a bit more information and see how the doctor wants to proceed. 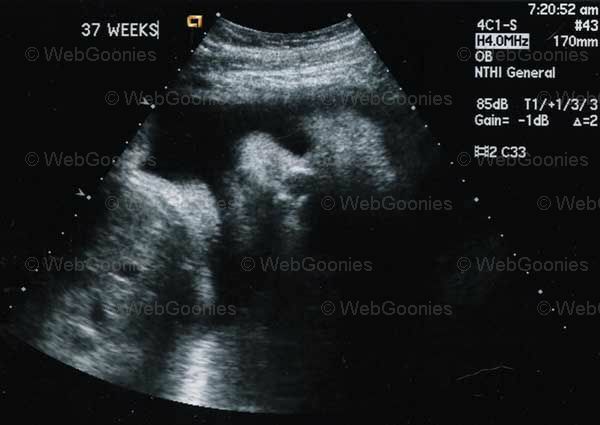 The ultrasound below shows a pretty decent shot of his chubby face. I was also born with a chubby face and later turned into skinny kid (gotta love that high metabolism). The first thing that came to my mind when seeing this new picture was that my sons face looks like the face on Mars. Interesting. Congratulations! Great blog...keep it up! Actually the mysterious "face" is on Mars. Thank you for the correction. I figured I had it right since I found Google results for it. I guess I'm not the only one mistaken. I saw an inside the womb documentary on either NGC or some channel that always has baby stuff on it and they said the real cause for labor is the baby breathing. The show stated that the natural chemicals the baby exhales irritates the mother's uterus and causes contractions after enough has been exhaled. So according to this information your baby is definitely getting ready and mom might be starting slight contractions she doesn't even feel yet. BTW: I had a 7 Lb 9 oz baby girl (which is about 2 Lbs heavier than any baby girl has weighed in my family) and those last 2 months were tough on my ribs because she'd always be kicking them for more room. I personally think a bit of 'extra' weight on a baby is a good thing since they are bound to get sick and lose weight. For example my daughter at 6 months went from the 70% to the 25% in weight just because of a bad stomach virus (she was hospitalized for a day). Also find out if your hospital has a vhs or dvd player so you can rent/buy movies for the possible long wait. Good luck and let us know when your son is born! Jessica, my wife believes she has been having true contractions for quite a bit now. She has had braxton hicks contractions though for months and months. As for the DVD player, we are lucky to have a fairly updated hospital in which case we get a private room with TV, shower and few other nice things. We believe they also have a vhs/dvd player but we do need to get confirmation of that. Thanks for reminding me.